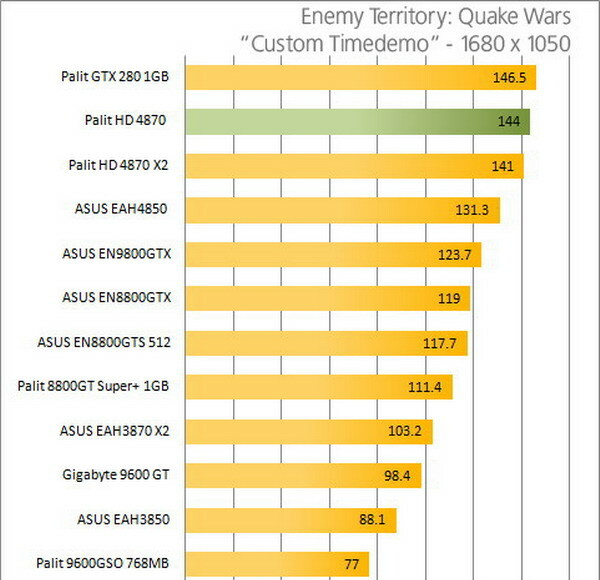 Like its lesser compatriot, the 4870 beats NVIDIA at its price point. 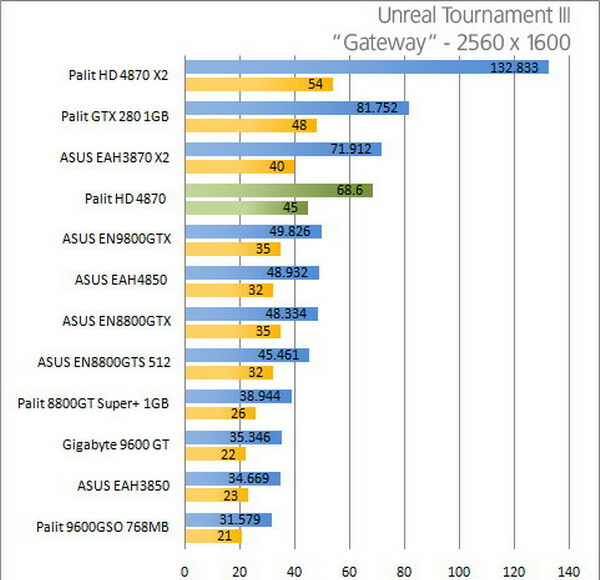 ATI is the only company with a current $300 card–although runaway sales have bumped up that price, temporarily. 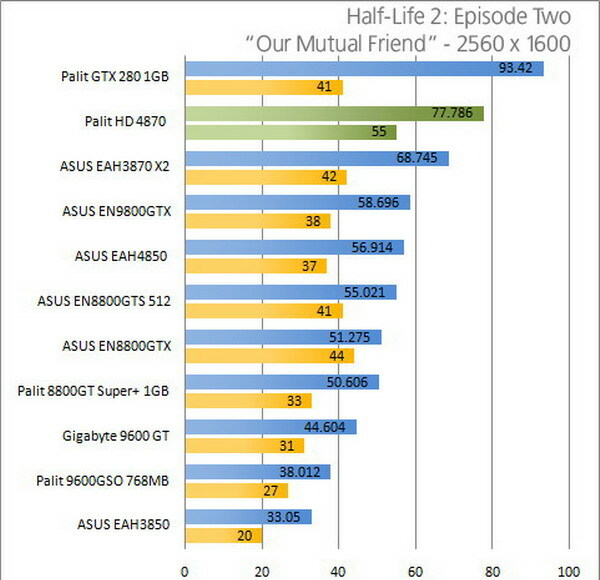 Still, they could sell it for more; $400, to match the GTX 260, and people would still buy it. It’s that good. 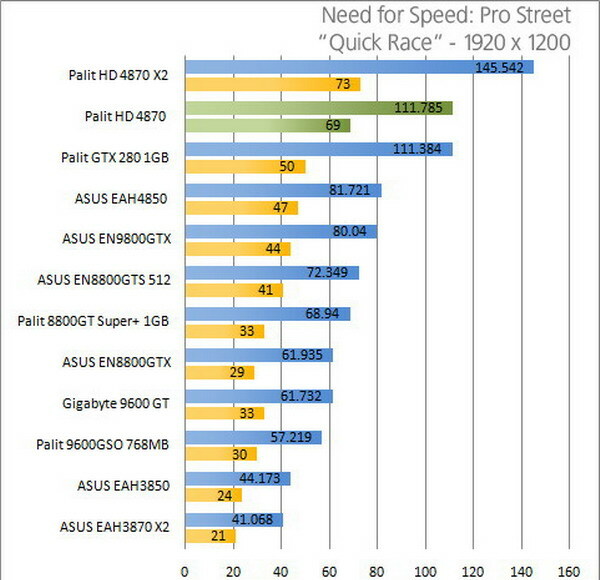 And ATI has needed a card at this price point. 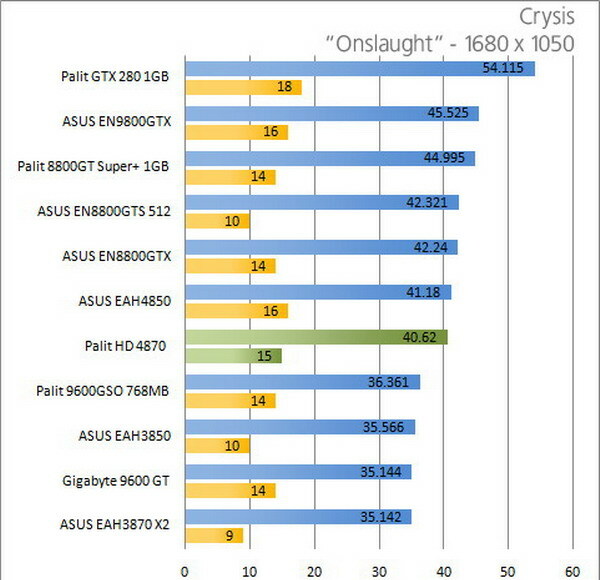 HD 3870 was nice, but it wasn’t great. It became a really smart deal when it dropped below $200, and then 9800 GTX came along, and AMD fell back into its old routine: selling decent cards at OK prices. They just weren’t breaking ground. Which has, apparently, paid off. 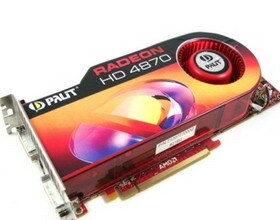 HD 4000 cards aren’t revolutionary, design-wise. They’re streamlined. And now, they’re great cards at great prices. 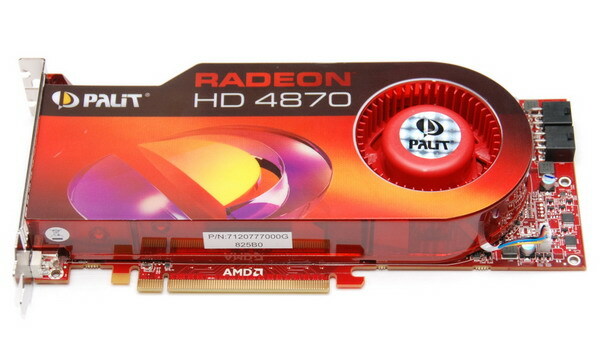 Palit’s sent us a few Radeon HD 4870s. Reference designs, stock clocks, and pretty packaging are still enough to shake NVIDIA’s foundation. 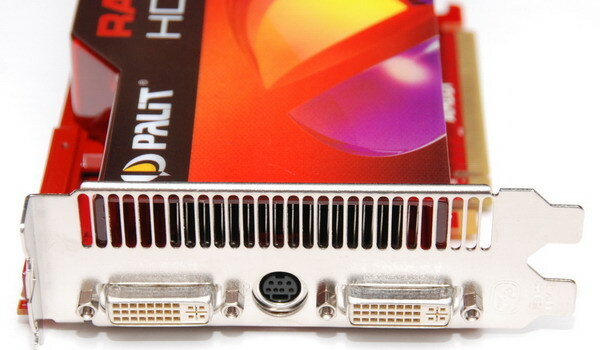 The big, two-slot rectangular heatsink looks municipal, and uses two big heatpipes to shuttle heat away from the GPU. The heatsink’s completely enclosed and vents no hot air back into the case. The fan looks serious, and takes up a third of the heatsink, between what’s visible and what’s exposed. 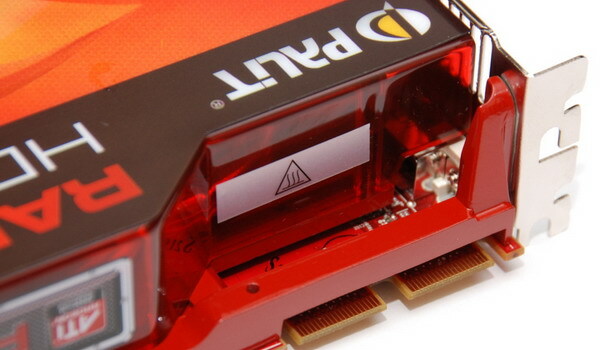 Like the high-end ATI cards of the past, the card relies on solid-state power regulation; there are only three (aluminum) capacitors on the board. The PCB, thankfully, isn’t full-length (about 9.5"). It’s nice to have a top-performing card that you don’t have to worry about fitting inside your case. The power connectors face the front end of the card. Of course, the card is CrossFireX-ready, with the standard two CF tabs at the top. The back of the 4870 is just as cluttered as a 4850; it’s an expanse of transistors with no blanks on the component side for extra memory. The inclusions are very minimal. 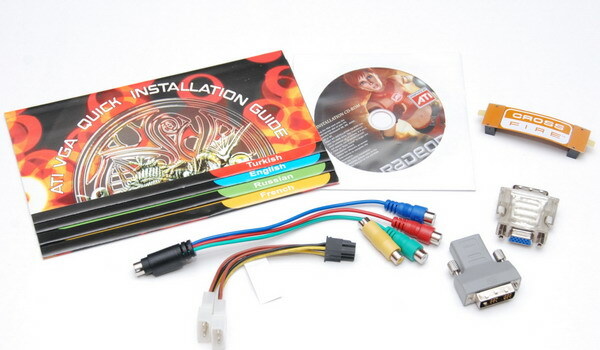 There’s one component-out cable, a single VGA adapter, an HDMI adapter, and a CrossFire bridge, along with the quick-start guide. Instead of a vixen, the box sports Palit’s mechafrog, nice. The card has a discreet pastel design–discreet for pastel, at any rate–also nice. 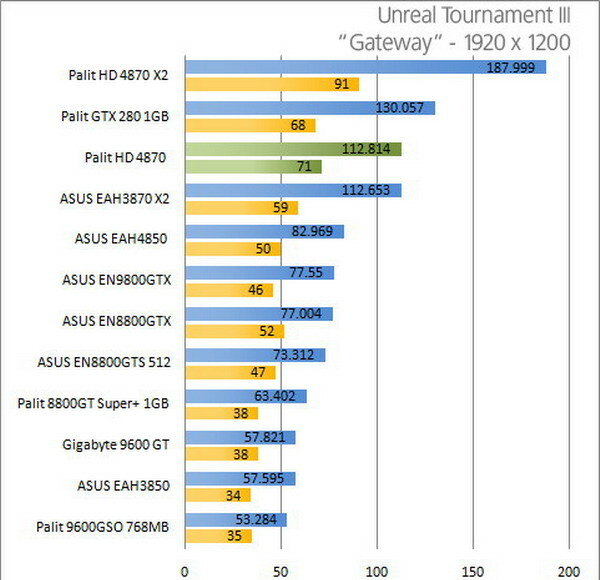 The card does play games very well, at the top by a small margin, ahead of everything else. 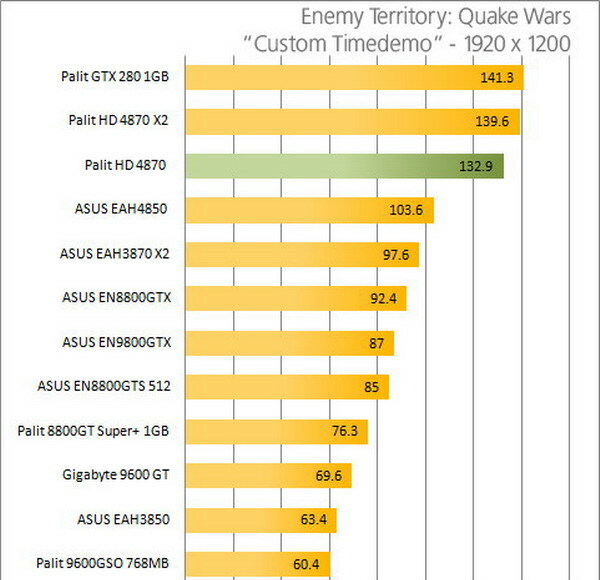 The GTX 280 still goes faster, sure, but it also costs double. I can’t help but think that this card is limited by its 512MB framebuffer. 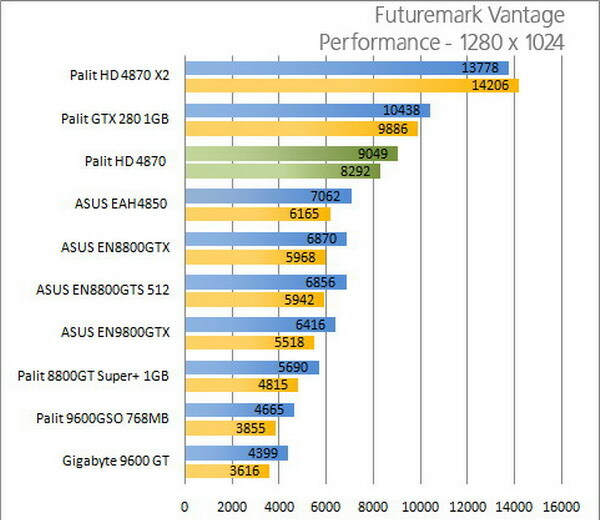 Again, the card that beats the HD 4870 is the GTX 280. 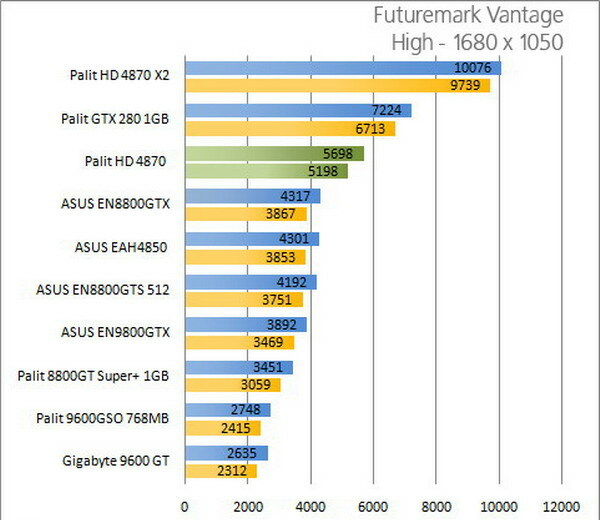 There’s no shame in that, since the 4870 matches or beats ATI’s reigning champ, the 3870 X2. 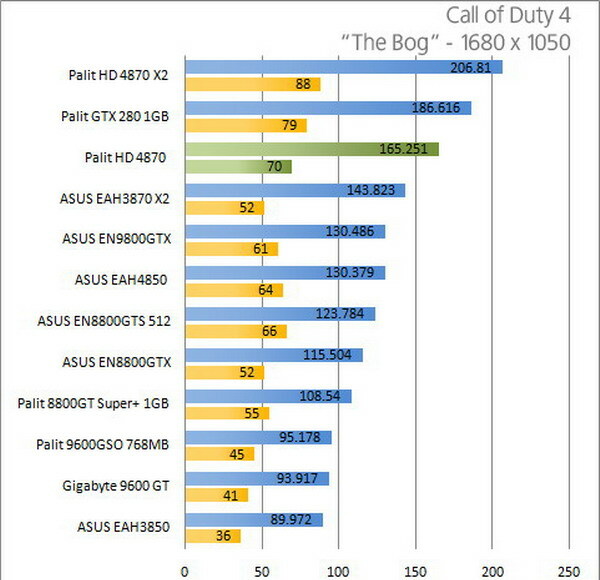 Identical to a 4850 in this regard, a 4870 excels with video. 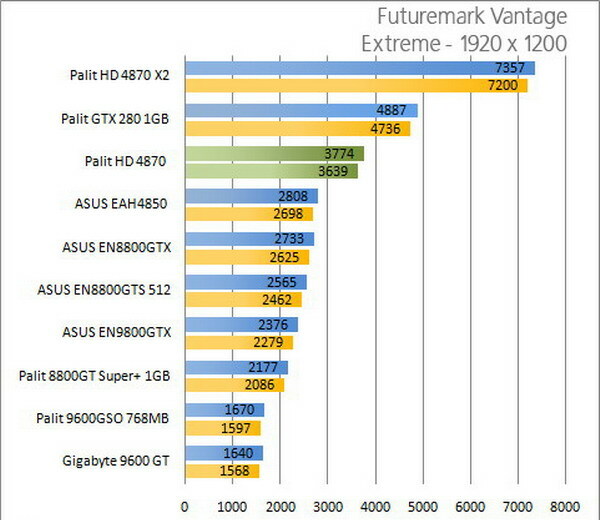 That shouldn’t be a problem for a flagship card, but there you have it. 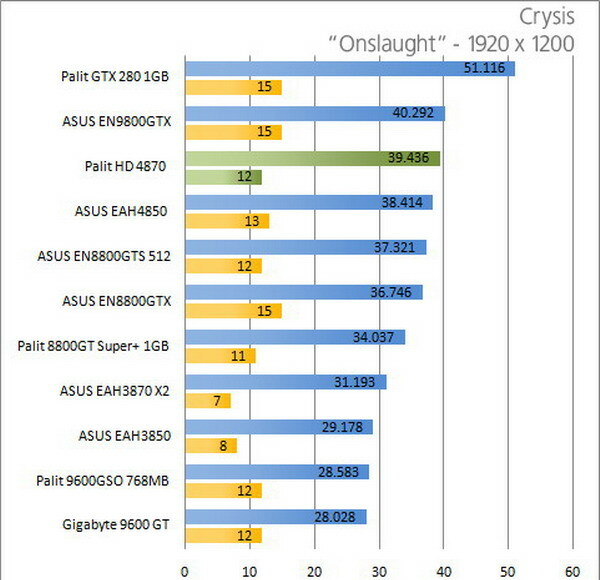 The previous subjective shortcomings of ATI’s video processing, namely delays with moire compensation, are now gone. The 4870 breaks the mold here, for ATI. 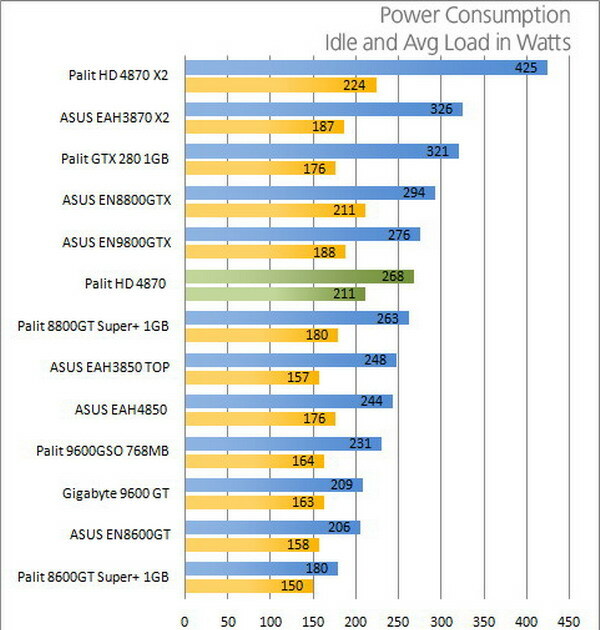 It uses a lot of power, 75W at idle. 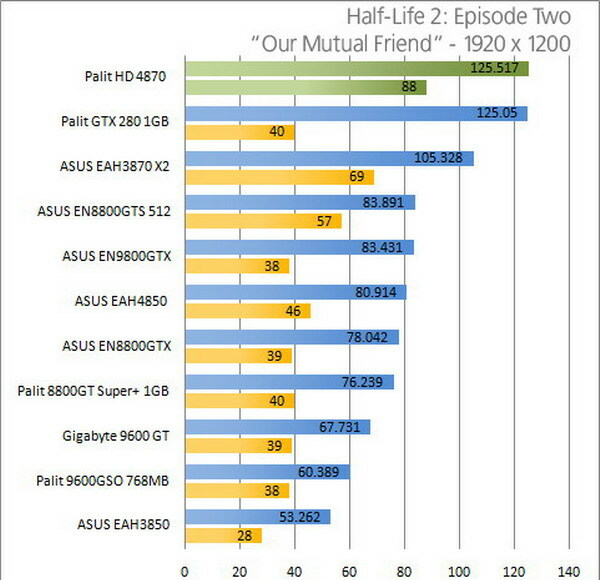 It’s nothing compared to the 200-series NVIDIA cards, which is a feather in ATI’s cap. The heatsink does an great job of cooling the card, and it runs cooler than a 4850–about five degrees cooler, in the 80 degree C area. It does this at a cost of peace and quiet. The fan would be a lot less aggravating if it ran at a constant speed; the thermal sensor varies the fan a lot and frequently, making its profile higher than if it just blew constantly. 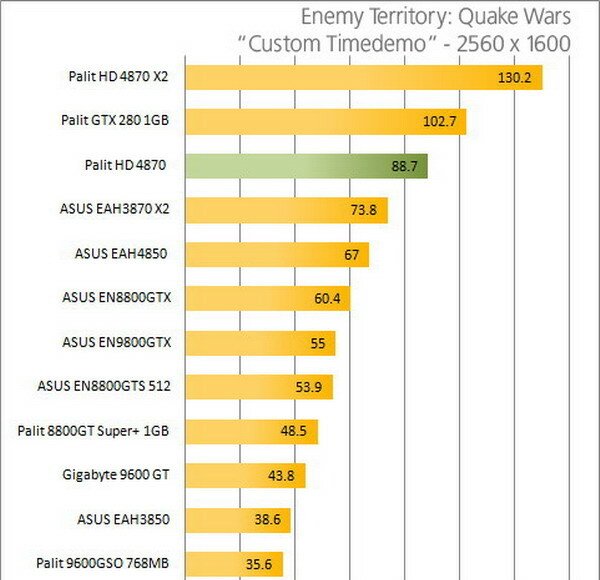 It’s nowhere near as loud as a 200-series card, but it’s still worse than a 3870. The fan that cools, though, is the fan that overclocks. Unfortunately low, I hit the Catalyst Control Center’s overclocking ceiling of 790 core/ 1100 memory. 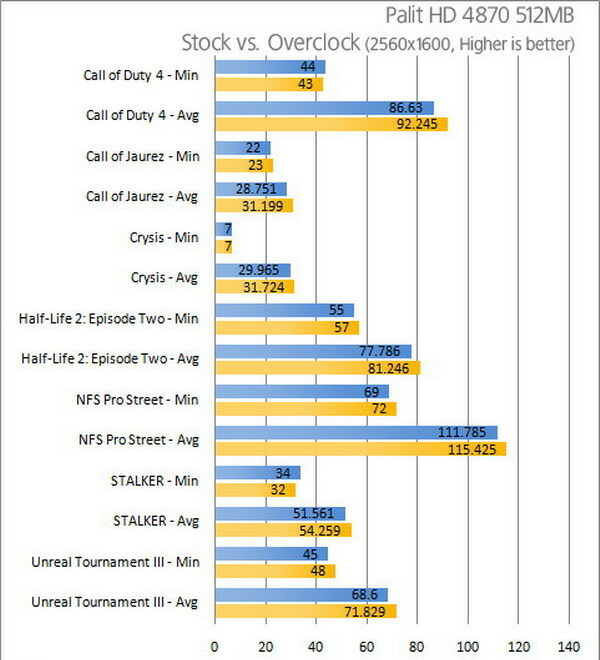 That’s fine for the memory, stock clocked at 900MHz–a 22% overclock! 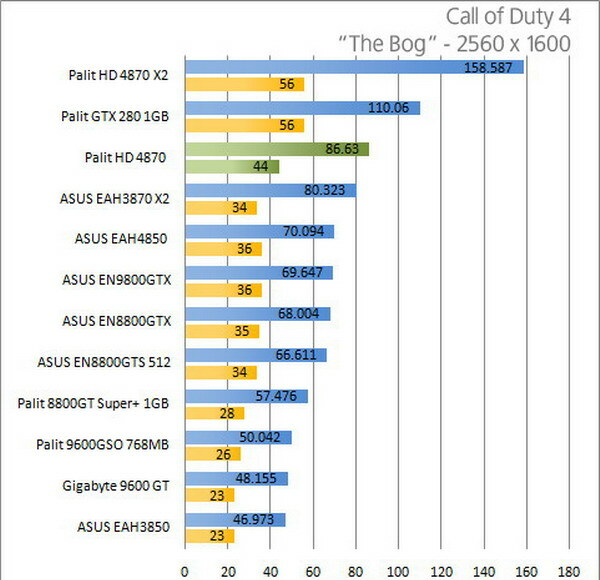 This pays off particularly well since the memory is this card’s real bottleneck. But the core only got a 40MHz increase, up from 750. 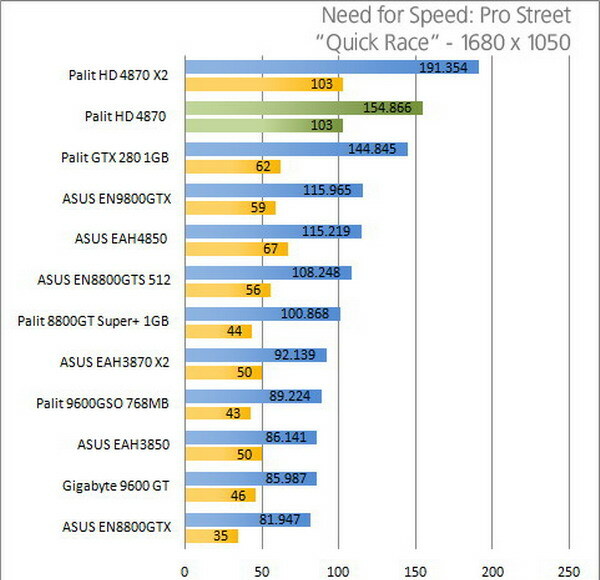 For $200, the 4850 has a lot of competition. For $300, the 4870 is without challenge. Which, if it had a little more direct competition, I think people would be quicker to criticize it. 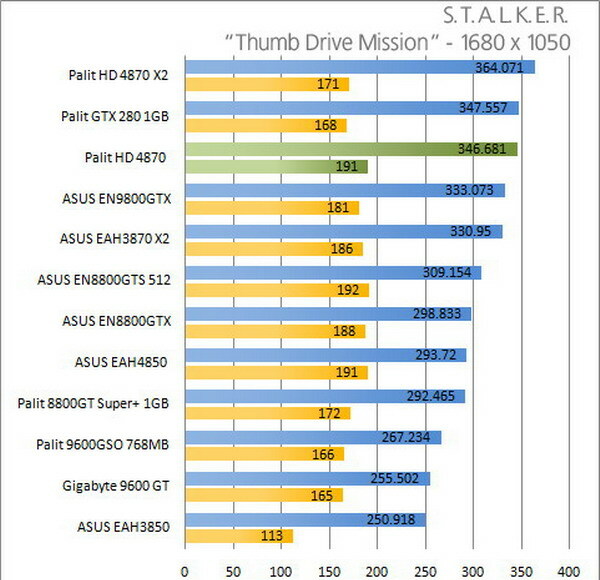 Primarily, I think 512MB is too little RAM for the card; it could do a lot better anti-aliasing with some elbow room. Secondarily, the card consumes a lot more power than ATI cards do, traditionally. It’s not a huge jump, but it’s not a small amount, either. The stock cooler does a loud job of cooling, and you’ll have to go third-party if you really want to overclock. 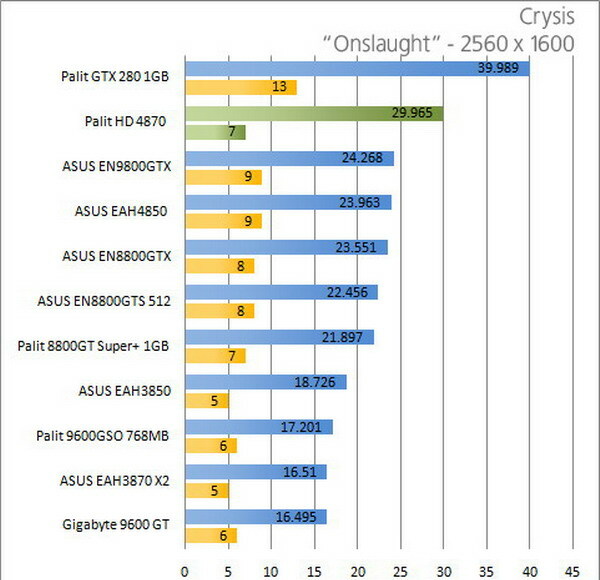 All that aside, the card is begging for CrossFire, a relatively easy configuration given the ubiquity of CrossFire-ready Intel chipsets. 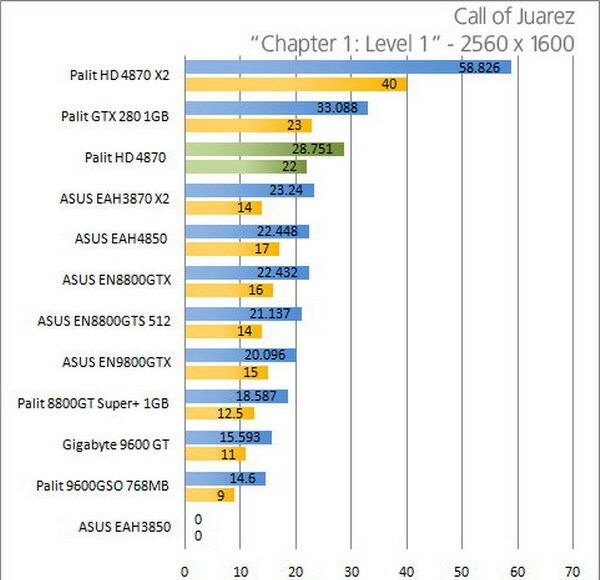 And like the 4850, it’s Linux-ready, with open- and closed-source drivers good to go. 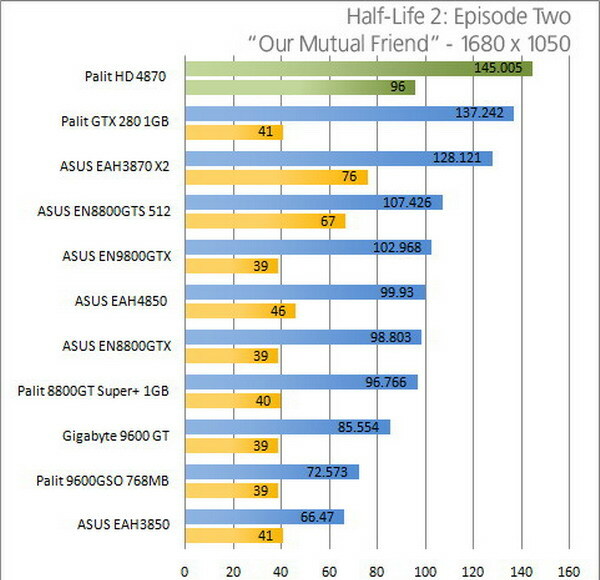 The real win is having a $300 card: NVIDIA made a lot of money with the 9800 GTX before the 4850 forced them to sell it for $200. 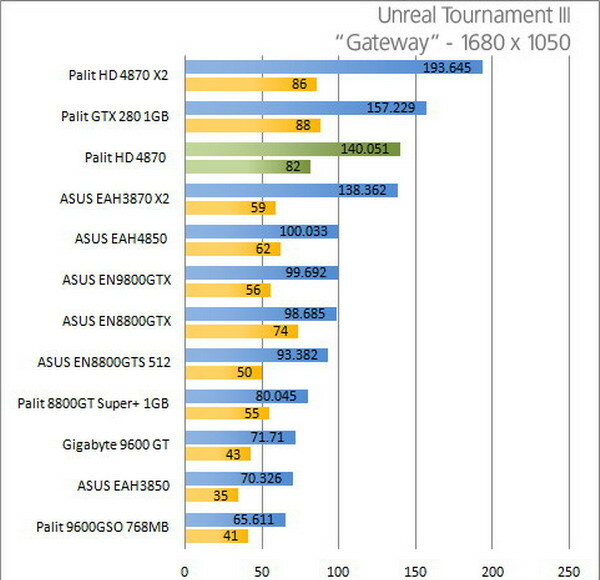 Now that bracket belongs to ATI, who, for the first time in years, is dictating hardware costs, not following prices set by NVIDIA. We’ll have to wait for board partners to add innovation. So yes, the card isn’t perfect, but like they say, it’s lonely at the top.